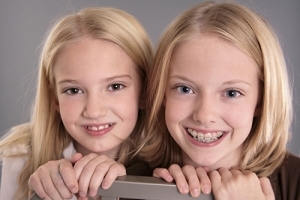 Though it is true that braces are not just for children, early prevention of problems can most certainly be beneficial. The American Association of Orthodontists recommends children have their first evaluation no later than the age of 7, because at this age is when the first adult molars start to erupt. This is the time when orthodontists can evaluate the structure and monitor growth and development. Malocclusions, literally meaning “bad bite”, is one of the most common reasons for a referral to an orthodontist. A correct bite for the mouth is when the points of the molars fit the grooves of the opposite molar, and the upper teeth should fit a bit over the lower teeth. Treatment is to correct the alignment and spacing within the mouth to rid of overcrowding and abnormal bite patterns.